CAGOP CONVENTION | There’s not much left but up for the California Republican Party, as the state’s conservatives meet in Sacramento for their spring convention. With the party sitting quietly outside of every statewide office and sitting in the aftermath of three months of obscurity following the Democrats brief supermajority in the Legislature, the party is looking forward to new leader. They also await tempered words of advice from Karl Rove, formerly known as “Bush’s Brain” to move the party to the center. Rove’s speech Saturday afternoon may be a handful of bitter pills hard right conservatives simply do not want to hear. Following a disastrous and colossally money-wasting bid by Rove to influence the past general election, the architect of President George W. Bush’s rise to power, is peddling a far less radical bill of goods. One Alameda County Republican attending this weekend’s event says he will be carrying around handcuffs to symbolically arrest Rove for his comments, some adherents of the Tea Party believes is slight at their particular brand of conservatism. The likely election of Jim Brulte, a former Republican leader in both houses of the Legislature, should conform nicely with Rove’s call for somewhat moderate Republicans, if not, ones simply deemed “electable.” Brulte is known more for his pragmatism and less for his interest in the nuts and bolts of policy. You might say Brulte will be more interested in how the state GOP’s engine is running rather than what color is painted on the car’s exterior. All of lot of work will be needed to right this ship. Republicans, at this point, have just a single name of the list of likely challengers to Gov. Jerry Brown and that name is exactly the reactionary candidate people like Rove and Brulte would like to steer away from. Former Assemblyman Tim Donnelly, the same person who attempted to carry-on a concealed weapon onto an airplane in 2011, is the only option right now. Although, his diatribes against Democrats on the Assembly floor were the height of entertainment, his anti-immigrant sentiment is not the type of language a party desperately hoping to begin picking off Latinos from the burgeoning Democratic base needs going forward. If the dearth of Republican statewide is a major problem for the party, then the scene in the East Bay is a double dose of depressing. So far, the Republican Party in Alameda County is a near non-entity with few conservatives holding city council or school board seats. Around election season, Republicans in the county routinely grumble about the inability of the county apparatus to give them any help, whether it be financial or organizational support. Even the party’s lone rising star, Chris Pareja, who won an astonishing 22 percent of the June primary vote for Congress in the 15th District with no money, chose to run as an independent. He joined the party late last year and will serve as a convention delegate this weekend. Despite the party’s dire situation in Alameda County, statewide Republicans might be wise to look to the East Bay for tips on how to move to the center on touchstone issues like gay marriage, medical cannabis and opening its tent to Latinos. Moving ever so slightly with the majority of Californians on these issues might not only bring in new voters to the party, but may also encourage current leaders to either not leave the party for their political expedience or come back to it. Alameda County Supervisor Scott Haggerty famously left the Republican Party a few years ago, as did Fremont’s new Mayor Bill Harrison. If the coast was clear for some closeted conservatives in Alameda County to once again see the light, the rise to, at least, even-footing with Democrats in the state might not be as much heavy work as thought. 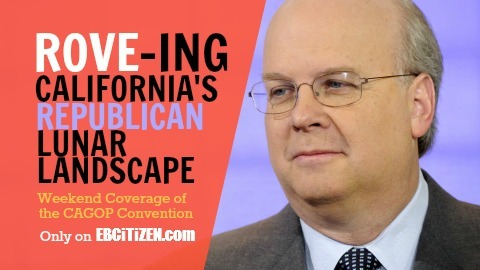 Posted in California GOP Convention, Chris Pareja, Karl Rove, Republican, Tim Donnelly. Bookmark the permalink.